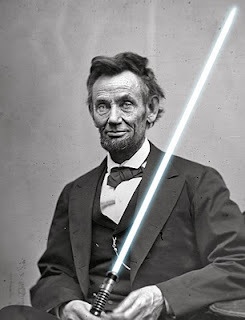 My friend Nick is having a rough day, and posted the following on Facebook: "Someone photoshop a picture of Abraham Lincoln with a lightsaber for me, please. That's the only thing that could cheer me up today." Ok, Nick. I accept your challenge. I'm always looking for quick exercises to improve my Photoshop skills, and if I can cheer up a friend in the meantime, well then it's a double-win (not to be confused with a double-rainbow). This wasn't particularly challenging, as the lightsaber was already available as a free .psd file, but it was fun to make! I liked the results so much that I decided to share them with the rest of the internet - or the slice of internet that reads my little blog, anyway. Enjoy. I hope this brightens your Thursday. Ed note: Nick just emailed me with the following photo. 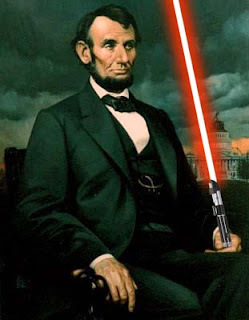 Do you have your own Lincolnsaber photo to share? Link it in the comments! dang Lincoln was a funny looking guy. Ah, pre-TV politics. "Well he writes well--he must be hot. I vote yea." I bet people didn't even know about the light saber! Goodness! He aged from the first photo to the last. The poor fellow had a lot on his plate. He could have used a lightsaber.